Michael Parola received his Bachelor of Fine Arts Degree from the State University of New York at Purchase and his Master’s and Doctor of Musical Arts Degrees from the State University of New York at Stony Brook. His primary teachers were Raymond Des Roches and Richard Horowitz. Mr. Parola was a founding member and percussionist with the Aequalis Trio from 1984-1993 and then founded the Core Ensemble in 1993. With both ensembles he has commissioned dozens of new chamber music trios for the unique instrumental combination of cello, piano and percussion with hundreds of performances and residency programs throughout the United States and at international venues in England, Russia, Ukraine and Australia. Orchestral concerto engagements include commissioning and performing with the Aequalis Trio the Chinary Ung Triple Concerto with the Phoenix, Honolulu, New Hampshire and Stony Brook Symphonies and also commissioning and performing with the Core Ensemble the Bernard Rands Triple Concerto with the Cleveland Chamber Symphony, Florida Philharmonic, Waterloo-Cedar Falls Symphony and New Hampshire Symphony. His recordings have been broadcast internationally and can be heard on the New World, Albany and Centaur labels. Michael Parola served as percussion instructor at the Harid Conservatory of Music from 1993-1999, Florida Atlantic University from 1993-1998 and the Conservatory of Music at Lynn University from 1999-2008. 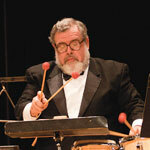 In addition to his roles as Percussionist and Executive Director, Mr. Parola has served since 1995 as Executive Producer for nearly a dozen Core Ensemble chamber music theatre works; unique multi-genre programs combining chamber music with narrative theatre.